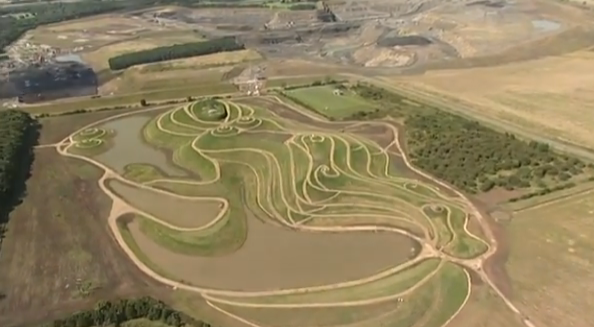 The facts and figures about Northumberlandia are endless. 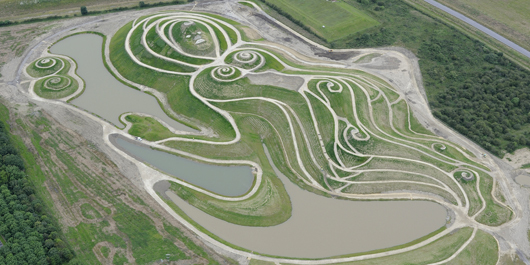 It is ‘a unique piece of public art’ … ‘set in a 46 acre park with free public access and 4 miles of footpaths’ on and around the Lady of the North, ‘a stunning human landform sculpture’ of a reclining woman. It took 7 years to plan and 2 more to construct, involving over 10,000 man hours. 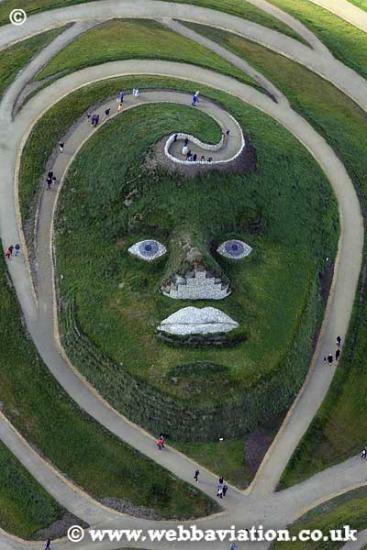 The Lady is apparently ‘the largest landscape replica of the human body ever seen in the world’…indeed the ‘largest ever piece of landform art’. Rising up to 112 ft (34m) above the surrounding land and 1,300ft (400m) long, she is made up of 1.5 million tonnes of rock, clay and soil. 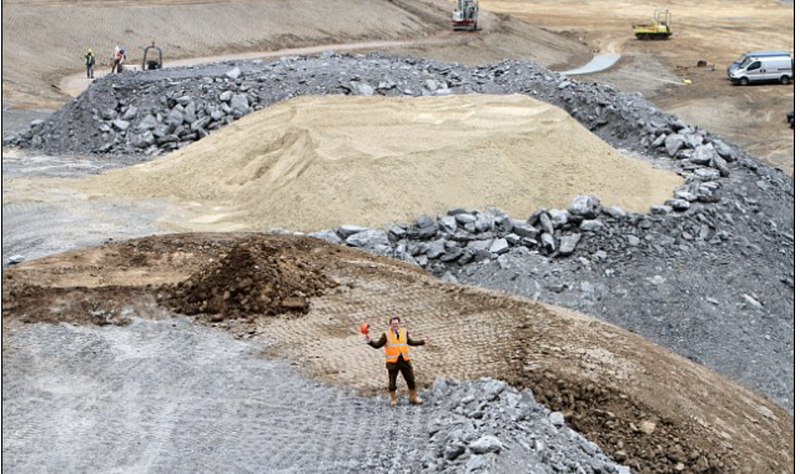 The lakes on the site cover the same area as 10 Olympic-sized swimming pools.The Lady is expected to attract 200,000 visitors a year….etc etc etc. As I said the facts and figures are endless. so why not start doing that here? I’d seen accounts in the press but all the facts and figures in the world do not get you close to the reality. I visited as part of the programme for the Garden History Society and Association of Gardens Trusts joint conference, and the the coaches unloaded us in a car park on the edge of a wood. 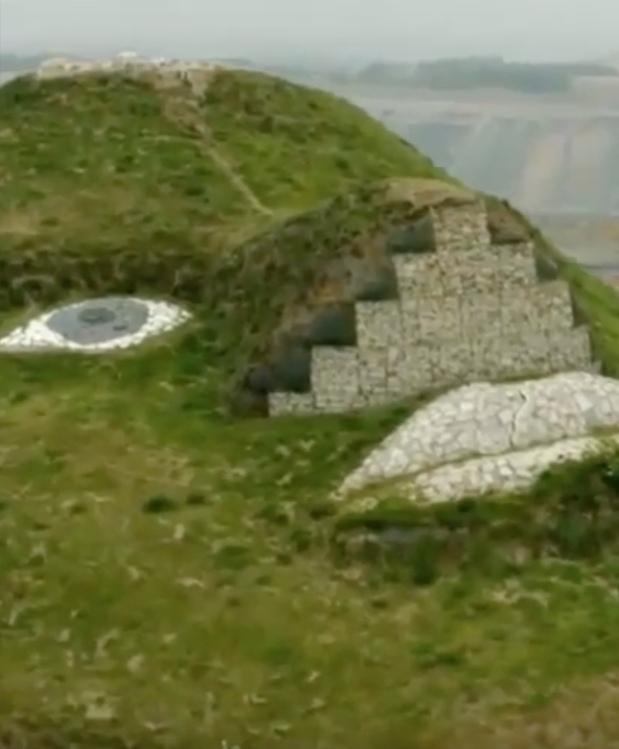 [bottom right on the plan above] As we emerged from the shade of the trees on the other side, in front of the twin viewing mounds, one could see the looks of amazement all over people’s faces. None of us had known quite what to expect & from the side of the wood we still weren’t quite sure what it was – but it was certainly different and it was certainly big! Within a couple of minutes the 70 or 80 delegates had done one of two things. Some stopped to read the information boards to find out more about what they were seeing and going to see, while others just set off at different paces and in different directions down some of those 4 miles of footpaths to find out for themselves. Both made the right choice! Later, it was great fun to watch so many people enjoying themselves clambering about, trying to identify the various bits of the Lady’s anatomy, watching the birds or the activity around the pit or just sitting in the sunshine taking it all in. 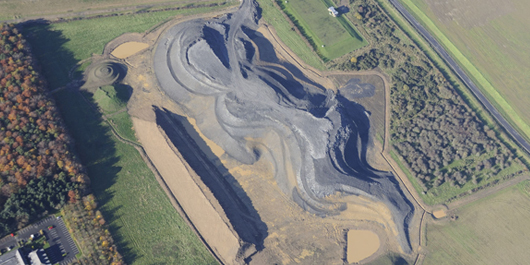 The project first saw the light in 2004 when Blagdon Estate, the landowners, and the Banks Group, operators of the huge nearby Shotton opencast mine, which can be seen from one side of the site, wanted permission to expand their mining operation onto adjacent farmland and dig out both coal and brick clay. 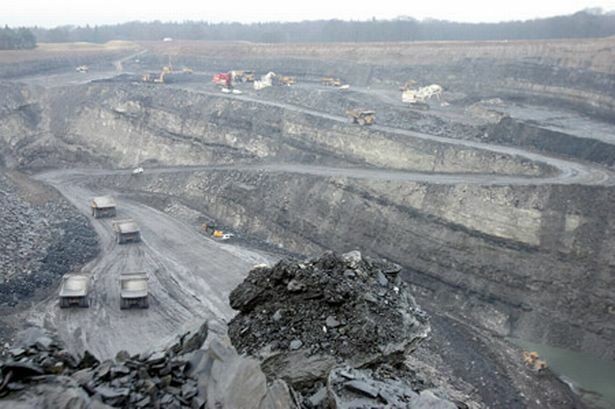 They knew they would face immense opposition because of the damage to the countryside and the impact on tourism, despite the demand for the raw materials and jobs the expansion would create. To counter it they decided to offer an incentive. Planning gain is nothing unusual from developers wanting to placate their opponents and especially to provide an incentives for the support of local planners and politicians, but this was to be more than mere planning gain. 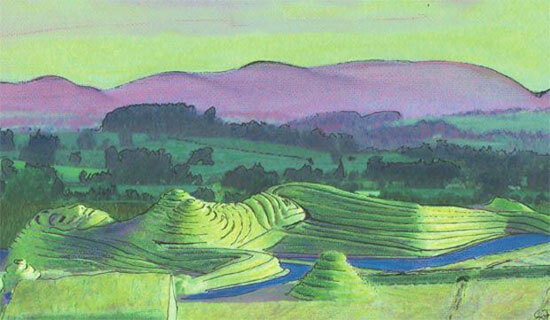 Banks and Blagdon commissioned Charles Jencks, probably the best known landform sculptor in the world, and asked him to design something that would not just enhance the lives of the local community but be an enduring legacy for the local economy. 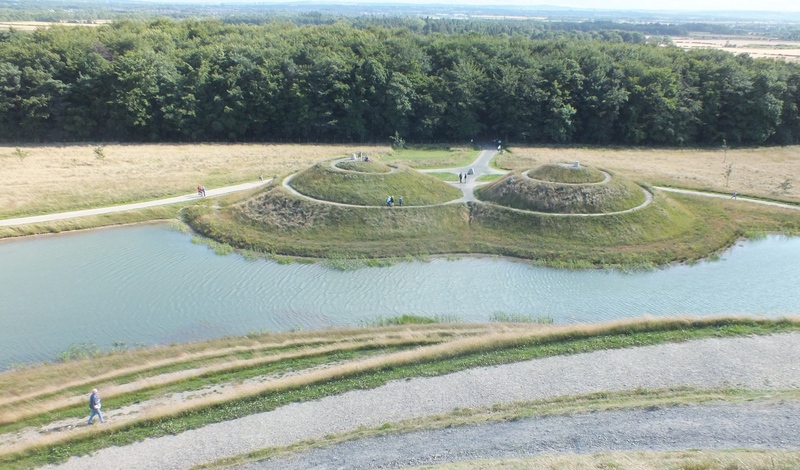 There were claims that of course for Blagdon & Banks this was a clever way of avoiding the much heavier costs of clearing the debris and restoring the site afterwards, and it may of course be true. But sitting on the coach back to Newcastle I didn’t hear any comments that weren’t positive. 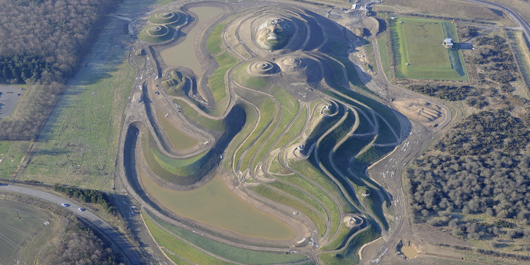 Most people seemed to think that, whatever ones views about the politics behind the incentive, Northumberlandia itself is nothing short of spectacular. Work began in 2010 with rock and clay from Shotton being laid down in strata following the contoured pattern designed by Jencks. There is a rock core which has been covered with thre￼e layers o￼f 20cm thick clay and then finally a 10cm covering of topsoil. 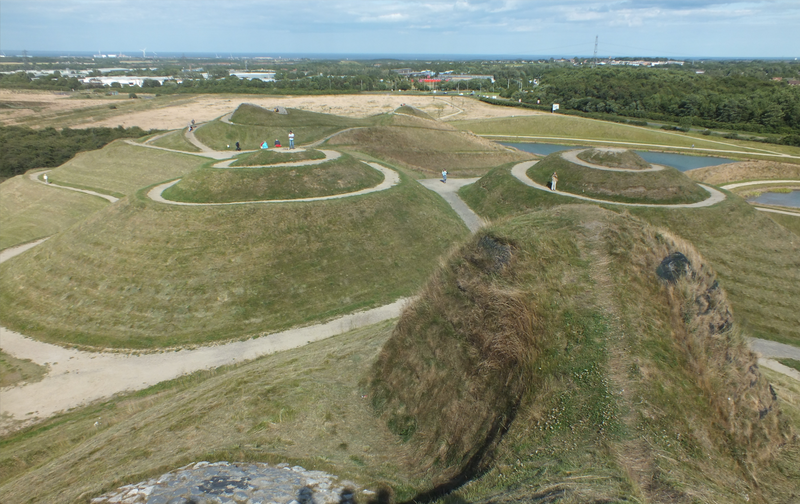 When this was completed the landform was blasted with “hydro seed”, a mix of grass seed and fertilizer sprayed under pressure which sticks to the soil. 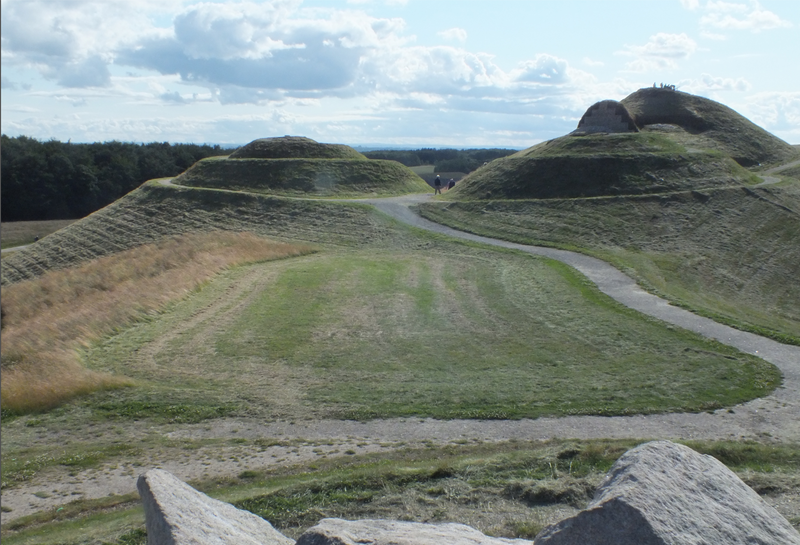 As the grass seed germinated so the rock shape slowly transformed into a green living landscape. 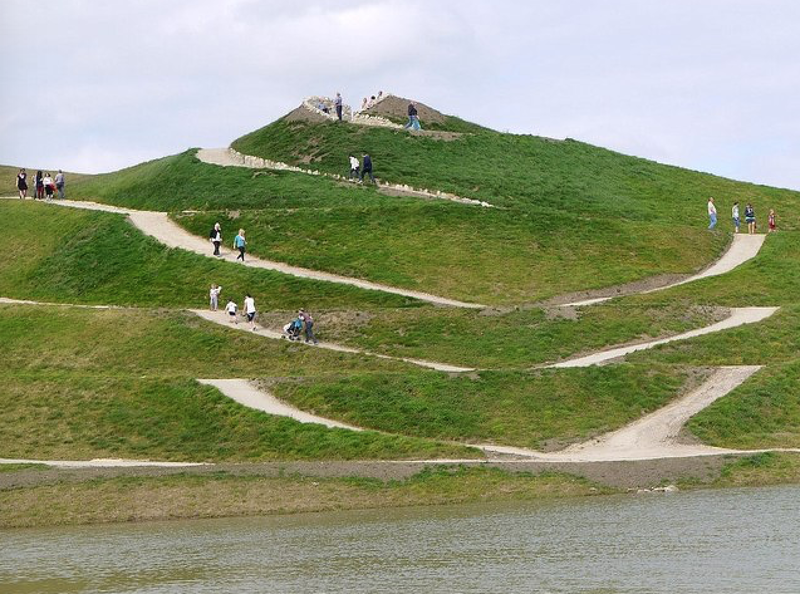 The face, paths, features on the hip, knee and ankles, and the viewing platforms were then constructed with a hard stone surface all of which also came from Shotton. 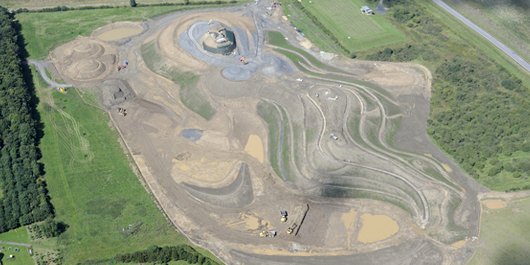 A drainage system has also been installed on the landform to help prevent erosion and this feeds water into the adjacent lakes. Jencks also points out that she is not modelled on any real person but is a collection of metaphors. And he is certainly not bothered by a spot of irreverence. The landscape is now the responsibility of the Land Trust, which currently has ownership of around 2000 hectares of land around the country. 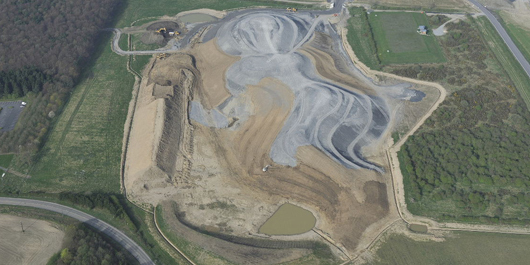 Day to day running of the site is in the hands of Northumberland Wildlife Trust More of the opencast mine will eventually be brought into the restored landscape when Shotton is worked out around 2018. 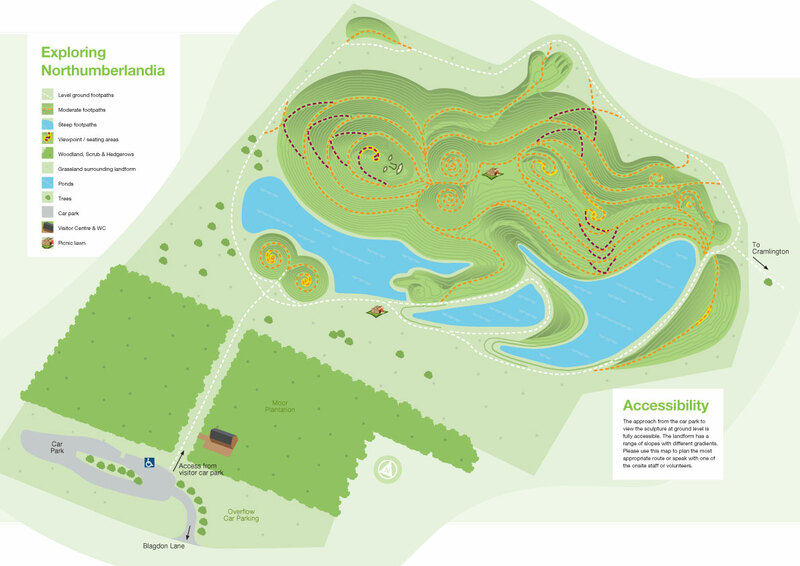 Rather than become a highly manicured landscape the park and sculpture is going to be allowed to develop naturally with minimal interference, so it will mature over over time and change with the seasons. I’d love to see it under snow! 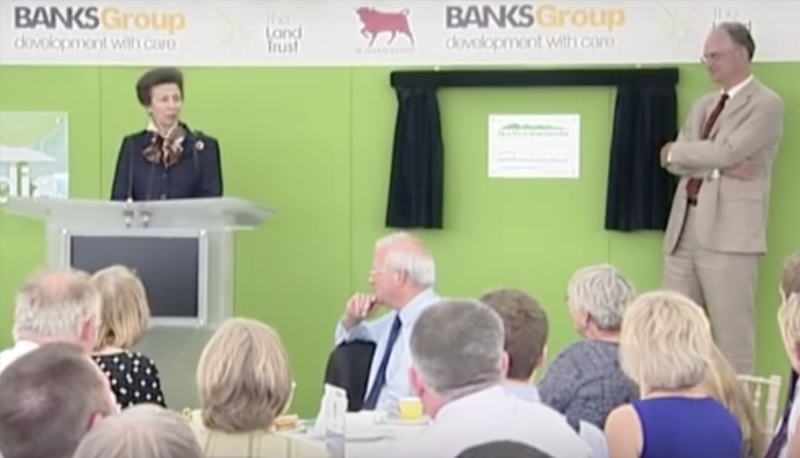 There’s a short video by the Trust narrated by Christine Walkden on YouTube which explains the management regime [and of course there are dozens of other video clips there about the site as well if you get enthusiastic and want to know even more…. 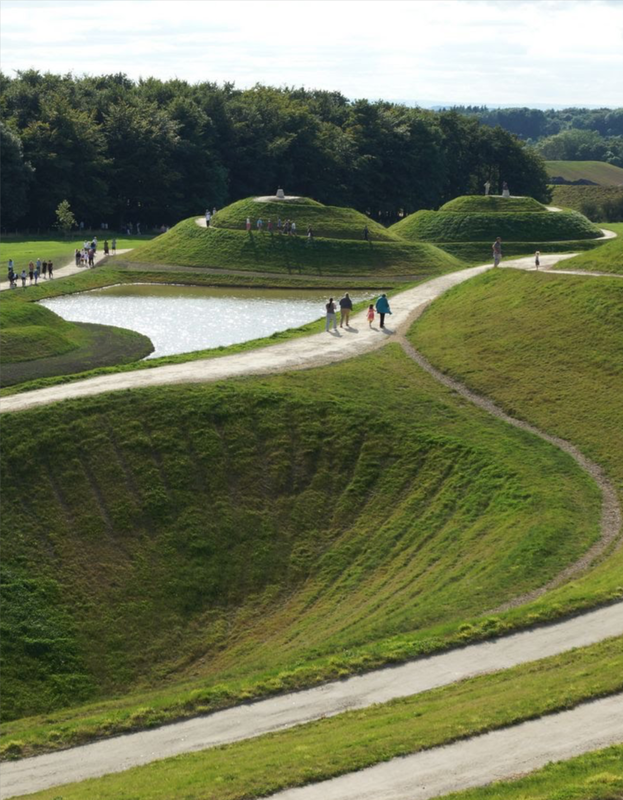 This entry was posted in Uncategorized and tagged Charles Jencks, Land sculpture. Bookmark the permalink.